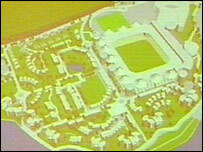 Gillingham Football Club have revealed plans for a new multi-million pound stadium complex. The plans would include what the club calls an American-style entertainment complex and casino. Chairman Paul Scally said he can see no long-term future for the club at its present Priestfield Stadium, despite heavy investment in developing it. Gillingham have been trying to raise support for plans to move to Temple Marsh at nearby Strood. Unveiling the plans on Friday, Mr Scally admitted he had begun looking at sites outside the Medway area. 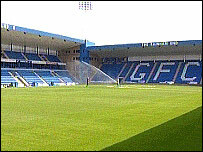 Priestfield has been Gillingham's home since 1923, but only holds 11,400 fans. The chairman said the relatively small size of the stadium was not its only problem. Mr Scally told the BBC: "Moving would be a big step, but it's a necessary step. "I've said since I came here that there's no long-term future for a football club here at Priestfield. "It's in the middle of a high-density area with massive parking problems, no parking in fact. "Obviously residents are not happy with having lots of people arriving at various times of the month and there's no development facilities for us to expand." Mr Scally has met with Medway Council to discuss a move to Temple Marsh.